The basic, handheld Vinduino is a calibrated AC resistance meter. An Arduino inside the rugged enclosure sends current first this way, then that, through the moisture sensors and measures the voltage drop across some known resistors. At least half of the development work, however, was focused on the in-ground humidity sensors. As dirt gets wet, it conducts more easily. You could, in principle, simply measure this resistance. But different soil compositions make calibration difficult, and corrosion of the probes is equally a problem. Finally, the terminals of the probes themselves can create a battery when placed in the soil, vastly complicating the calibration problem by imposing a voltage across the resistance that you’d like to measure. [Reinier] spent a lot of time getting his DIY gypsum water sensors accurately calibrated, standardized, and compensated for “concentration cell” battery effect. His great documentation of the process makes it replicable on a shoestring budget. Making the sensors robust and cheap is important, because the next step is to drive three (or more) of the sensors into the plants’ root zo ne at varying heights. Driving multiple sensors into the ground allows the farmer to target his plants exact water needs. Measuring how wet the soil is at the surface, in the root zone, and then just below the roots makes it possible to figure out the net water flow, and water the roots only when they get dry, not when the ground on top of the roots is dry. 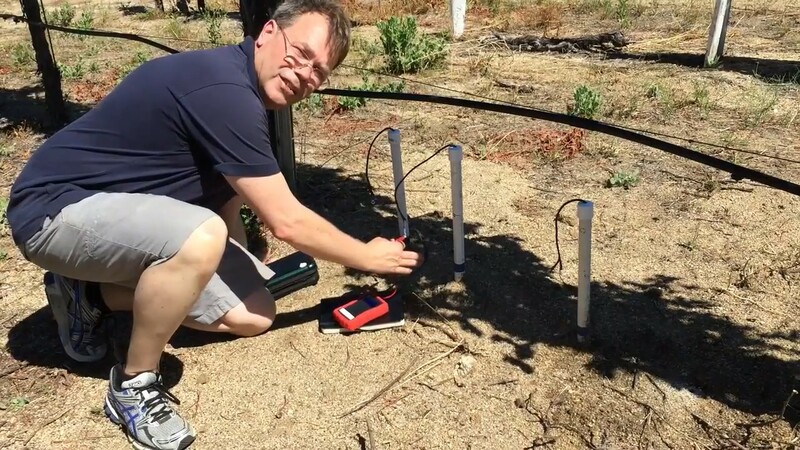 The handheld unit connects up to these water sensors and makes measuring the soil moisture at these different levels as easy as walking around the vineyard with a log-book. And because the handheld unit’s firmware is open source, nothing stops the farmer from using different soil humidity sensors that require different calibration curves, or from using the same setup to measure soil salinity. But [Reinier] has a whole system in mind, and it’s one that doesn’t involve walking around the fields taking measurements. He’s already built up prototypes of a networked, permanent version of the handheld unit that can stay in the field and record continuous moisture data. The next steps are fully-automatic watering control, by combining the control of irrigation valves and water pressure dataloggers. Optimal, minimal water use in agriculture is an idea that can help save water on a large scale. By making the measurements easy and cheap, Vinduino helps farmers take the first step. By making it all open source, modular, and accessible, much more likely to have an impact. So far, [Reinier] estimates that he’s cut his water consumption down by 25%, and by further developing his system, he’s making it possible for others. Good luck with Vinduino and congratulations! There were 10 projects named as Best Product Finalists during the 2015 Hackaday Prize. Enjoy the recap video which touches on each of these, and dig into the lists of entries to learn more. Such a terrific and relevant project. Congrats again to Reinier, the Vinduino is amazing! Congratulations Reinier! I really enjoyed watching your Talk at the SuperConference (we’ll be publishing talks as soon as video is edited) and it was great to meet you. I hadn’t seen this interview you did with Adam until putting together this post, but I really enjoyed it — I always appreciate people who spend their free time learning, building, and in your case, making the world a little bit better. The interview was a real treat – Reinier gave us all some great backstory on the project. Thank you Mike for getting the video up edited, rendered, and published. White man improves agriculture, black will still prefer to cry “more aid” and will slaughter each other in the name of some semitic myths from iron age.You can’t help populations with average IQ of 70 or 80. Not sure irrigating crops that will grow elsewhere in the US without irrigation is a sane policy or wise use of a limited resource. Note really sure where you are headed with Whit Vs. Black ,but it seem to ignore that it is an exercise in the pot calling the kettle black. Very nice to see a fellow dutch make such promising but simple devices. excellent work. I’m also really impressed (as a farmer who juggles multiple other jobs, too) by how you managed to keep the project on-track during the height of your growing season and harvest -and- work at a full-time job as well. Mother Nature really doesn’t really give much of a hoot what -your- schedule is. When it comes to grapes (as opposed to apples or cabbages), a delay of one or two days can make the difference between a bumper crop or no crop at all. I salute your dedication! so is it a 1-yr residency or a 6 month residency? One thing I feel like everyone EXCEPT for Reinier ‘got’ was that the tech in the controller is neat but not novel. I think what really won this product is the cheap sensors. I hope he realizes that. Ha-ha yes, the joke is on him lol. It inspired me to make my own and I’ve been running them for over 4 years. Fully networked with continuous feedback into my irrigation system. Sorry, but his cheap sensors are not novel either. The credit should go to “The Cheap Vegetable Gardner” for the sensors. how has the output changed over time? have you validated their calibration? 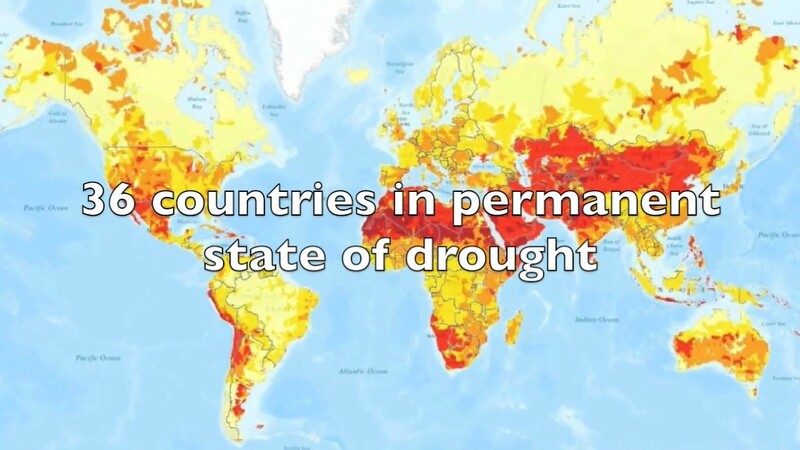 “36 countries in permanent state of drought”. If it is permanent, then it isn’t drought, as in a dry spell, it is by definition, an arid country. Congratulations Reinier! I am glad the project made it to the best product, i think it is one of the most realistic and useful projects in this year’s prize! This is excactly what world needs! Please more innovations like this and I can also believe we are getting into right track in terms of extending our planet’s age! [Reinier van der Lee] Beautiful project! Sincere congratulations on winning the award.. Source: “Sustainable Salinity Management on your Vineyard” http://waterandvine.grrdc.com.au is down. I wish Reiner much success and don’t allow the project to be cancelled/commercialized or hijack by any frivolous patents. Also, Ensure work within the legislation that ALLOWS individuals to draw from rivers (AS WELL AS PROCESSING RUNOFF WATER TO REMOVE SALTS/NITRATES) and NOT allow the fiasco that Nestle/Arrowhead to leech water from the dying San Joaquin during the drought. Sorry for the “eco/tree hugging links”… However conservation is everyone’s responsibility. Aside from the standard Rain-barrel catch or runoff gutter pipe/French drain to underground cistern. Anyone working to build out cheaply made proprietary free Dew/Condensation/Fog collectors? I’m interested in how desalination of the soil can be handled. Congratulations for the award and for the use of the simple censors. A bunch of such pots can be “networked” to a central reservoir system via garden hoses, in order to “detect” when they need water based on difference in their water (liquid) level. The evaporation is technically minimal as all the hoses can be below ground level and the entire system is self regulating. Not to speak that is virtually free of maintenance, compared to anything else. And by itself, it can be vied as a cell, a structure that can be replicated, if bigger agricultural system needs to be irrigated. Doesn’t Sparkfun sell a fairly cheap soil moisture sensor? $5 per sensor vs <$1, that's a pretty significant difference when rolling out hundreds of these. The sparkfun sensors also don't appear suitable for direct burial – tack on additional time & money for weather proofing them. 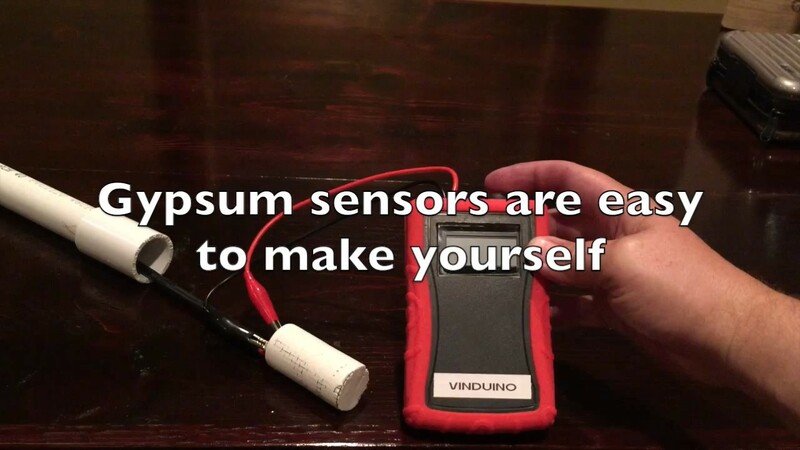 The gypsum sensors on the market are not 5 bucks. I’m sure they less in bulk but retail they are 40 a pop. The illustration showing a drip system that crates a layer of water moving down through the soil, going just as fr as the lower roots. I am wondering if this would leach salts from the upper layers and concentrate them around the lower roots. A bad thing. The system could be set to occasionally run more water than the plants sneed so as to flush the salts away from and below the roots. Reading this information So i’m glad to convey that I have a very good uncanny feeling I came upon exactly what I needed.